Many years ago I swore that I’d never be one of those people that bought a Lazy-boy recliner. First off, I’d never seen one that I thought was remotely attractive. And second, third, and fourth off, it simply screams YOU MAY AS WELL START CALLING ME MEE-MAW. When our house was decorated in early toddler, we did have a faux recliner type of chair. But I didn’t categorize it as a true Lazy-Boy because when I purchased it, it was a pretty lavender fabric with white piping. And it was excellent for nursing. But someone should have warned me about having actual pretty fabric, spilled breast milk, and small children. And while they were at it, someone should have warned me about having a white couch (even though machine washable slipcovered), 3 children, and a husband with a taste for red wine. Needless to say, a few years ago the whole mess had to be thrown out. And we scrimped and saved for a set of furniture that could be hosed off. In other words, leather. When all of my medical issues became a deterrent for actual slumber, Fiddledaddy suggested that he buy me a leather recliner. I resisted with great enthusiasm. But one Saturday morning, I allowed him to take me to Ashley’s Furniture just to take a look. I told him that the only reason I would go, would be to look for a coffee table. I’ve had visions of a nice off white square shaped coffee table in my family room, to accommodate family game nights. Not that I could actually get down on the floor with my family without employing the use of the backhoe to right me again, but still, it was a dream. I could not find a coffee table. But instead allowed myself to be steered in the general direction of the barkoloungers. The children were very into the hunt. They located a plush black model WITH CUP HOLDERS. Emme even found an electronic one that reclined and declined with the push of a button. It may have even had an ejector seat. The price tag reflected its fanciness. Pass. I actually sat myself down in a very comfy looking chair, that was a pretty deep off white (you may call it beige, I prefer deep off white). The litmus test for me, besides comfortability, is the ease in which the foot rest comes out AND MORE IMPORTANTLY, goes back in. Because my in-laws have a recliner that has knocked me into next week on more than one occasion. After sitting for a good 5 or 50 minutes, I decided that perhaps this chair did need a good home, and would go nicely with our other hose-down furniture. Because I’m not above playing the sympathy card, and armed with my leg brace, crutches, and 3 children, I was able to negotiate a very nice deal. I am now the proud owner of a barkolounger. If you need me, this is where I will be. I love it!!! 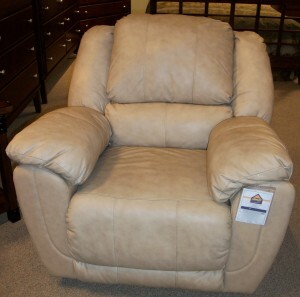 Call it the “MOM” chair and you are good to go! I have a feeling you’ll have some competition from the kids…glad you have found a comfy spot… thinking of and praying for you. Remember you can stuff tissue and magazines in the folds for easy access. Or even hide the remote there if no one is letting you have a turn. My husband’s recliner definitely saved my sanity when I had our first. He didn’t like to sleep at night so my mom taught me how to hold him while propping my arms with pillows. The baby and I would both get to sleep that way. I hope you enjoy your new chair. It definitely looks comfy! Looks like a great napping spot to me : ) Enjoy! Awesome! I hope you have many happy naps in your new home! The only thing missing will be the Chocovine. Exactly how do you plan to keep children out of your chair? I haven’t met a child yet that can resist a pop out foot rest! I love my rocking chair/recliner! It’s great for winter, when bad head/chest colds hit – I just hug a pillow so that it keeps my head propped up (so my neck doesn’t get a crick) and I sleep so well, even with all the congestion going on. Friend, after giving up gluten and dairy the LEAST of things you deserve is a new comfy chair! Hope you find some relaxation in your new chair this weekend! So what you are saying is the chair is another example of “My parents were right” We got some several years back to recline and watch TV and we love them. I know you will too. Enjoy.